Corsham is an ideal place to stay for exploring the southern Cotswolds. Corsham is a delightful historic market town on the southwestern edge of the Cotswolds, about 3 miles south west of Chippenham, 4 miles north west of Melksham, 7 miles north east of Bradford-on-Avon and about 8 miles from Bath. Corsham was historically a centre for agriculture and later the wool industry, and remains a focus for quarrying Bath Stone. It contains several notable historic buildings, such as the stately home of Corsham Court. In World War II and the Cold War, it became a major administrative and manufacturing centre for the Ministry of Defence, with numerous establishments both above ground and in the old quarry tunnels. The early 21st century saw some growth in Corsham's role in the film industry. 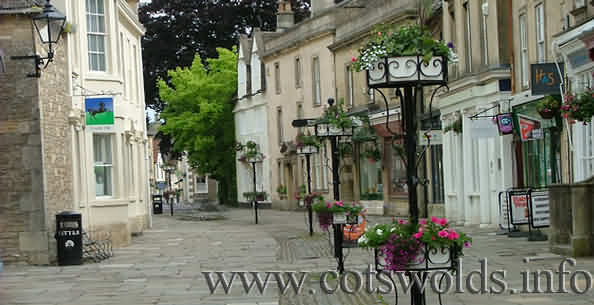 Corsham is on the A4 between Bath and Chippenham and within easy reach of the M4 motorway. There are bus services from Bath, Devizes and other towns around. The nearest railway station with frequent services to Bath, Bristol, London and elsewhere is Chippenham. 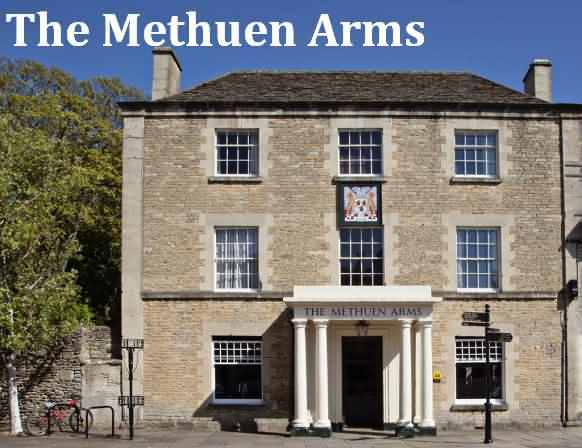 Each elegantly styled room at the Methuen Arms comes with a flat-screen TV and complimentary tea/coffee making facilities. Some boast exposed beamed ceilings and some en suites have free-standing roll-top baths. Guests can relax by the open fireplace in the bar area or dine in one of the inn’s restaurant rooms. Cooked breakfasts come included and the team of chefs put emphasis on well-sourced produce. The Town of Corsham has many shops and restaurants and is situated on the railway between London and Bristol, with the historic spa city of Bath just a 20-minute drive away. Stonehenge lies an hour away by car. 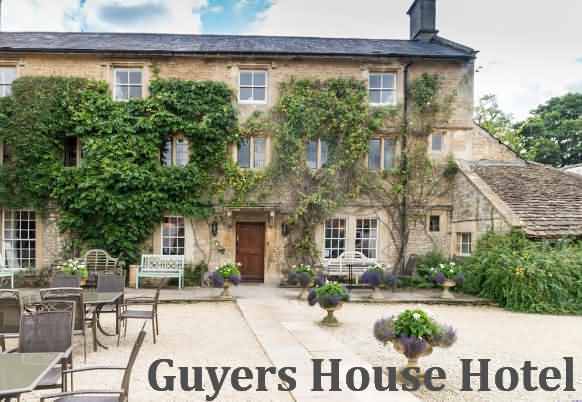 Located 1 mile from Corsham town centre and 8 miles from Bath, Guyers House is a friendly and relaxing 17th-century house with free parking, an award-winning restaurant, and impressive leisure facilities. The elegant rooms feature en suite bathrooms, tea and coffee facilities and a TV. Free Wi-Fi is accessible throughout, and many have scenic garden views. Guyers House is 10 minutes from junction 17 of the M4, and combines traditional charm and modern amenities. 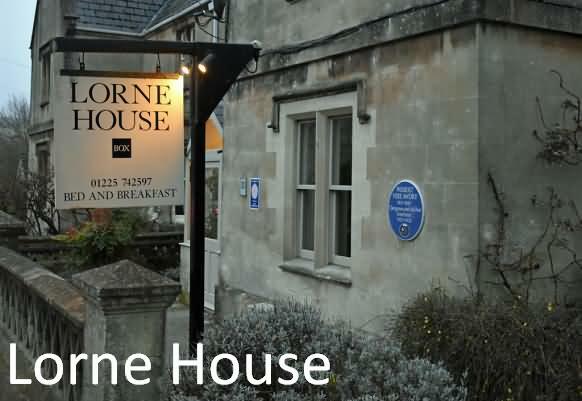 Lorne House is a Victoria villa, in the Wiltshire village of Box, just 6 miles from Bath and 3 miles from Corsham. Free WiFi and onsite parking is available. Each room has an en-suite and is either a bathroom or wet-room. Tea/coffee making facilitird, a hairdryer, flat-screen TV and ironing facilities are provided. All en suite rooms have free Wi-Fi, a flat-screen TV and DVD player. All windows are double glazed for extra soundproofing, and the front of Lorne House offered additional secondary glazing. Lorne House also offers both a cooked and Continental breakfast. Ingredients are sourced locally, where possible and the marmalade is home made. The Lorne is also locally famous as childhood home of the Reverend W. Awdry, creator of Thomas the Tank Engine. Corsham is just 3 miles from Lorne House while Lacock, Castle Combe and Bradford on Avon can be reached within 8.5 miles. Located at Biddestone 2.7 miles from Corsham.